in past 3 years i had alot of fun to develop for picochess. But as i said on google forum already my private situation has changed. For this reason i now decided to stop developing picochess (for free). But there is light on the horizon. Dirk together with Wilhelm released already a picochess v1.0 and v2.0. You can find his details on the google picochess forum. Begin of partly no longer valid section (see below “Update Feb 2019”)! Available from quarter/year plan. You need to get your RaspberryPi with a working internet connection during usage. As long the buyed time is not used out, picochess will operate in a full mode. If the time is out or y still not asked me for a license file picochess will allow to play 15moves and “setup position” is deactivated (=try mode). Same if y loose the iNet connection (=limit mode). These modes are displayed on clock once the status is changed, so for example if y just lost your iNet connection y get a message. As long y have a valid subscription plan y can get all updates of picochess, so the newest picochess release will work and every version before too. Available from year plan only. This version doesnt need a working iNet connection during usage. Your license is for a version available during yr subscription time. As long y are inside this time y can get the newest version you want. As soon the time is out, this newest version will continue to work forever – you just cant get newer versions. As the name already implies this license is only valid for this version y asked for. So, if y update to a newer version during yr subscription time, y need a new license file from me too. Please understand that i cant always change your license file(s) during the year (not speaking for the last one) in case a new version is released. I think 4 versions a year should be enough – but i might update yr license more often if my time allows this (fair use!). This license systems i had to implement to protect myself. Sorry, if y not happy – but i hope y can understand me. Due to this license system picochess will only work on RaspberryPi or DGTPi. To be with me on the newest versions of picochess y need to be a member of picochess.com club. Right now i offer 3 subscription plans. You can decide how long y want to be a member (the longer, the cheaper): for 1 month (6€), for 3months (15€) or for 1 year (54€). The time is counted from the day y signed in (so for example if y signed in on 17th Aug for a quarter plan its valid until 17th Nov – same for the other plans). This is a one time payment means no further charge after the time is over, so you have to get active again to stay in club. Especially if y decide for a years plan you get extra features the month/quarter plan dont have – thats mainly cause i want to build a group of people addicted to picochess not to make money. Speaking about “club”: I hope y post questions on this webpage (if y cant speak english, y can use german too as long its on the protected part!) not send me direct eMails so all can benefit from answers, thanks. From time to time i will also post articles, y can only see if y such member. Decide yourself if y enjoy the fully working 0.9N version or go ahead with me to new borders. To get such subscription please go to the bottom of any page (“Register” section). For the quarter/year plan y can request a refund if y have never asked me for a license file during the subscription time (no exceptions)! By requesting a refund your account is deactivated and a handling fee (7,20€) plus an usage fee (for each started week your subscription is running 1,75€) is charged. This means at least 8,95€ so please think first, if y want a subscription. Im sorry that i need to write such things – i thinked that should be clear – since my idea with these subscriptions was to build friends of picochess. If y make any protected software and/or protected text public available, crack protected software or ask others to do so, your account is forfeited (without money refund). Depending on the situation i might even block y for your lifetime and more (like lawsuit). Im very serious for this! Please respect my software is not for free. This is all about “fair use” so please be as nice as i am, okay? I wrote this post cause some people dont understand what the new way of picochess is. I hope this text makes it abit clearer for all of you. If y have any questions please ask here. Thanks. I no longer offer my picochess software!! Also i limited the plans to only month plan for the moment (so alot of what is written above makes no sense right now – cause y simply cant register f.e. a years plan). Please take into account, even y pay 6,00€ there is NO picochess software included anymore – only the “pico tool” is available. In case y registered a month plan (by accident) y can now request a refund. I only charge y a handling fee (€1,60) plus an usage fee (€1,40) for each started week yr subscription is running means at least €3,00. This is a limited time offer in Feb/Mar 2019 and only valid for month plan (refund for year plan unchanged: see above). why always(!) so negative? Despite one bug all very small – and since i find them and not the users (strange!) they cant be so big/important. How do you subscribe such plans, and where can you see them described? i updated my text to link to the register section. Thanks. The description is what y read here. What is not clear enough? Happy to answer all yr questions y might have. Well, the cost, first of all! But it’s mentioned in the bottom of the page. Anyway, I downloaded the free image and flashed on a SD successfully. Problem is I can’t access it because the standard pi user password does not seem to work: I am stuck at the cli login of the newly flashed image, can you help? no problem. I take this as an example to update my webpage on diffferent places to make the process clearer. Figured it out myself, but thank you so much for helping! Oooops, sorry, just noticed the black text below the comments! Sorry to spoil your post with so many questions that you might put in an article, but I don’t know where to write anyway! So, I have seen that jromang will continue your work; but you will do the same independently, and for a price, right? So, that’s a fork (in codeline, not chess-related!! )… Will you post links to jromang branch here? I have read it will be quite different from yours. Secondarily, I didn’t like the image that you made available (0.9n, right? ), so I installed picochess manually. BEWARE! At present, raspbian has pip3 9.something. It’s enough to run picochess and it will work, but if you run the pip3 update listed in install instructions, it will update to pip3 10.something and IT WON’T WORK (it seems it is currently broken, pip 10.x does not support cryptography 1.7). 1) Which version do I have? How can I check picochess version, in other words? 2) If I enable the autoupdate feature, will it update to your most recent versions? I guess nothing will happen since I am not a paid user, right? Or will it update to the latest license version – and therefore not work ’cause I haven’t a plan? Jromang’s plan is not 100% the same as mine for example he wants to remove some features, i will keep. I dont think, our codes are running in a way we can merge easily. But i will keep an eye on it and also post here about this. The images arent from me, i only link to the download places. What y didnt like with Michaels one? The current version y can see if y go to the picochess menu > system > information > version. From where y cloned y stay. So, y get the updates from yr cloning space. That also means, y wont interfere with my commits or suddently need to pay something (or a not working version). But the newer jromang versions have a problem to find the newest version. But since – at least right now – there arent any updates, y dont need to worry too much. Hi Jurgen, thanks for the info. I didn’t like his image is Raspbian Lite, and it was not easy to add a graphical environment on top of it. It should be, I know, but simply installing Xnvc and window manager and desktop environment on top of it didn’t really work for some reason. It was easier to burn a standard Raspbian image and compile Picochess. I have been struggling about joining your club, but I think you now got me hooked. 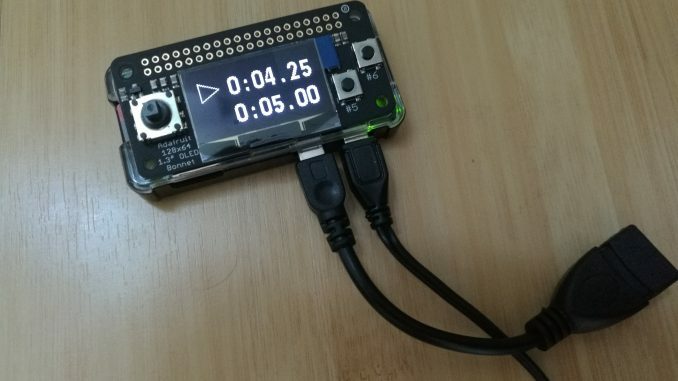 Just to confirm: Is that really a PiZero with an Adafruit 128×64 bonnet used as a display? This is exactly what I tried to implement and had to admit to myself that my programming days were too long ago. Do you still need a DGT clock for the time base or does it work with just the display? Could you share a little more information? I am really impressed that someone else came up with exactly the same idea of creating this minimal device. if y struggeling and the trigger to join club is this idea/pict, then keep your money please => what y see is really working (not using gimp or something) but its not ready and not public available (even y are a member). BTW. These are old pictures the newer display is as small but alot better 🙂 Yes, this system doesnt need a DGT clock anymore – but it can work with it if y want. thanks for your quick reply. I incidentally wrote “I was struggeling”… 😉 I did not expect to get the perfect solution, but to see you are working on something that I have been fantasying about for quite a while made my day. Perhaps I can even contribute in some way. This is not a big deal, but if you know how to make it work, let me know please. try the command line i sended y by eMail yesterday.